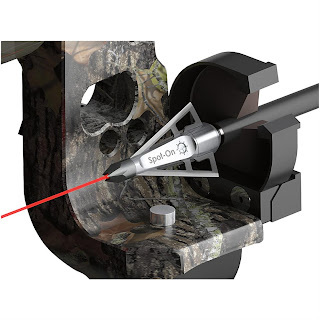 The Unlucky Hunter: Laser Broadheads - Dumbest Piece of Hunting Gear? I was flipping through the Sportsman's Guide catalog a couple days ago. I like the Sportsman's Guide. They offer a weird selection of amazingly low priced, quality hunting gear and crazy, useless junk. Those of you who shop there probably remember the tree stand rear view mirror. I have purchased a lot of my gear through them with mostly positive results. I enjoy looking at their catalogs, not only for serious shopping, but for the entertainment value of their weird stuff. Their last catalog had a couple gems, including the CVA Electra, a muzzleloader that uses a battery to ignite the powder instead of a primer. I'm tempted to buy one of these just to see how well it works, although the idea of basically pressing a button to fire a gun is not appealing. One item beat them all. The moment I saw it I thought Do people actually buy this crap? It was a broadhead with a laser pointer attached. No, I am not making this up. The idea is that you can use them like a laser sight on your pistol. Problems with this idea pop into my head instantly. First, and most obvious, lasers go in a perfectly straight line. Arrows fly in a very noticeable arc. At the very best this would be like having one pin on your sight. I know several archers who only hunt with one pin, and they are very successful. But these are marketed to make bow hunting easier, not harder. To overcome this disability they offer different colored rings that you can attach to your arrow. This way you can sight in each arrow to a different distance. Of course, this means that you cannot have an arrow ready until the deer stops and you know which arrow to nock. Second, the laser rests inside a hollow point tip. I could be wrong, I'm not a broadhead expert, but I've always thought that having a sharp tip was very important to penetration. The hollow point design works great in bullets because we want the bullet to expand and disburse it's energy. On impact hollow points slow down considerably by nature. Broadheads work the opposite way. We want them to retain their energy so they achieve as much penetration as possible. I would not trust this hollow point design to achieve the penetration necessary for a clean kill. Third, in most states hunting with a laser sight is not legal. You can use them in Virginia for furbearers, but the regs were unclear to me about using them for other game. I wouldn't risk trying without calling my game warden. I can kind of see how these could be useful for night hunting predators over bait. In this scenario you have a known range and penetration is not as much of an issue. But there is a fourth issue, they cost $50 each! $50 broadhead + $10 shaft +$10 lumenock = $70 arrow! There is no way I am going to shoot a $70 arrow out of my bow. I have trouble with my current setup that is $30 an arrow! Am I wrong? Is this an awesome idea and I am missing something? Have you found any amazingly terrible pieces of hunting gear? If so, please share!